It's September and while we may still be blessed with the odd glimmer of sun here in Ireland I have definitely felt myself reaching once again for jackets, jumpers and boots. Here are my top ten buys to help shift your wardrobe into autumn without feeling we're back in winter just yet. These pieces will form the foundation of your wardrobe and are the ten basics every girl needs now. As always you can click the images to link through! 1. These Tassel Suede Slippers from & Other Stories are my idea of heaven. If I'm going to buy suede shoes I buy them in a dark colour that won't show scuffs and dirt as easily as lighter options. These for me are the perfect transitional shoe to wear right now. Perfect with skinny jeans or work dresses, they're not as heavy looking as a boot so lighten up warmer looks. I will wear these all season long and can't wait to style them with my favourite ripped skinny jeans, oversized jumper and cross body bag. 2. I invest in a new black blazer around this time every year as I know from experience it's a piece I live in. I wear them to work, over dresses going out or dressed down with a v neck t-shirt and jeans. I always go for a long line style that will sit below my hips and something that's well tailored. I love this style from Karen Millen and am happy to pay for good quality. Shoes, outerwear and handbags are something I always save and spend more on as they have to face the elements and need to be well made. The cost of repeatedly having to replace items that fall apart after a month or two of wear soon adds up. 3. Good jeans are the foundation of half my outfits, skinny will always be my style of choice but I do love looser fits too. My all time favourite brand of denim is Frame, their skinny jeans cannot be beaten. For a more affordable option look at HM 360 shaping jeans they come in a range of styles. Autumn must haves for me include a good mid wash blue, a distressed black and a dark grey. 4. When I'm not in jeans I'm in leather pants. This is one place I save my cash and buy inexpensive faux leather pieces. Coated black jeans or leather stretch leggings, either will work. When I'm not in a dress these are my staple for nights out or dressy dinners. They should always be sprayed on and super tight, baggy leathers are not a good look. These Vero Moda pants are a great fit and do the job nicely. 5. Good t-shirts are in my opinion hard to come by, the cheap €4.99 ones in Zara just don't do it for me but at the same time they are not something I want to spend my money on. By far the nicest fit, best quality t-shirts I've found so far are from Cos. At only €15 they are a steal and come in 5 different colours. On another note Cos is fantastic for work wear, beautifully tailored pieces at a good price point that reflects their quality. They have a flagship store in Dublin city but I personally find it easier to shop online with them as everything is better displayed. 6. I live in jumpers all autumn/winter long, as it gets cooler I reach for roll necks but for now round necks are my preference. I love neutrals, greys and beiges but bright coloured knits can make such an impact too. I love this camel jumper from Miss Selfridge with a cut out ruffle sleeve, I also love this red Zara knit that would brighten up any day. 7. Scarves are ideal for this time of year as too often in Dublin your day can start out lovely and end in torrential rain. Not only do they add a layer of warmth but can be a lifesaver when you've no umbrella and need to save your hair. Cashmere scarves are a favourite of mine as they are super warm and so soft on my face, zero scratching. Buy one in a neutral tone that will go with anything. 8. Jumper Dresses are ideal for this time of year when you can still bare your legs but want a little warmth, I love roll neck styles. Always look for a heavy knit that won't cling to all the wrong places. 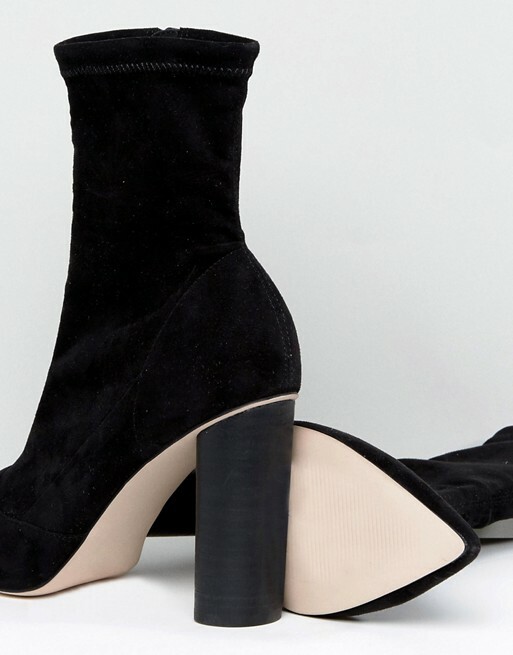 Asos have a great selection and I pair them with either flat over the knee boots or super high sock boots, see number 9. 9. Sock boots are everywhere this year, not all styles appeal to me. I just can't get on board with the cream and white versions, maybe if we lived in Miami but in our puddle drenched streets they just wouldn't work. I do love them in black however, super high and super tight on the ankle they look great with jeans, dresses and leather leggings. LOVE these from ASOS. 10. Pretty shirts and blouses are a staple in my closet. Basic white oversized shirts can be worn to work or with leathers and boots and add diversity to your wardrobe. Ruffle sleeves are still in and as impractical as they are I do love them. Choose brights to add colour to your neutral pallet on a budget and they will transform your look. I love the red leopard print shirt below!